Saracens maintained their 100% record as victory over Wasps sent them back to the top of the Premiership. 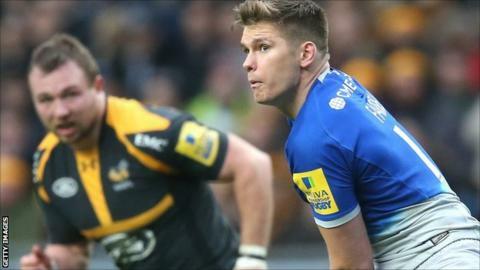 They held a narrow lead at the break through two Owen Farrell penalties, Jimmy Gopperth responding for Wasps. Gopperth and Elliot Daly brought Wasps level at 9-9 before Duncan Taylor's converted try put Saracens ahead. Farrell converted that try as well as his own score and also sent over a penalty, while Frank Halai's late try for Wasps was merely a consolation. The result means Saracens leapfrog Exeter, who had gone top after beating Sale on Saturday. The first half was dominated by the boot with Farrell edging Saracens ahead at the break with two penalties to Gopperth's one. Despite being pegged back at 9-9, Saracens started to dominate and Taylor scored the first try of the game after bursting through midfield and embarking on a 40m run to the line. A ricochet went in Saracens' favour soon after and Farrell was the grateful recipient as he collected to go over for their second try. The England fly-half converted both scores to put Sarries in total control before adding a penalty to take his match tally to 21 points. Wasps did manage a late consolation, with one-Test All Blacks cap Halai going over in the corner and Gopperth converting. "I'm frustrated because that four minute spell (of two Saracens tries) took the game away from us. "It was nip and tuck until then and it was going to be a three-point game. "I was disappointed to concede the first try from a set piece and the second was a fortuitous bounce of the ball, so we let the game get away from us. "You have to give them credit but it's a boring way to play. We want to be more expansive than that, but their kicking game is extremely accurate with an aggressive chase. "It's very difficult to play against." "They kicked a bit more than us in the first half. They should have played the way they normally do as it probably would have been more successful. "We were really dominant in the first half and should have scored more points as we pulled the trigger too early and could have been 13-0 up. "After that we gave away too many penalties, which stopped us building pressure but we still won it comfortably. "It's still a subdued dressing room as we are disappointed with our performance but our set piece was really good and we were clinical when we needed to score those two tries." Wasps: Miller; Halai, Daly, Leiua, Piutau; Gopperth, Robson; Mullan, Johnson, Cittadini, Launchbury, Gaskell, Haskell (capt), Young, Thompson. Replacements: Shervington, McIntyre, Swainston, Davies, Jones, Simpson, Jackson, Tagicakibau. Saracens: Goode; Ashton, Taylor, Barritt (capt), Wyles; Farrell, Wigglesworth; M Vunipola, George, Du Plessis, Itoje, Kruis, Rhodes, Fraser, B Vunipola. Replacements: Brits, Barrington, Figallo, Hamilton, Brown, Spencer, Hodgson, Bosch.